You'll find allies and adversaries within these pages, from playable races for your sci-fi game to cosmic horrors and apocalyptic enemies inspired by classic themes of science fiction. This volume collects nearly 300 monsters from CR 1/2 to CR 30, including template grafts and starship-level creatures from tier 4 to 18! 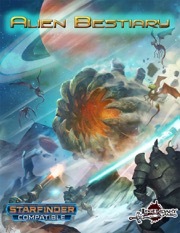 You'll find denizens of the Legendary Planet and Aethera settings, Starfinder versions of classic creatures like the myrmidon robot, plasma ooze, and star-spawn of Cthulhu, alongside brand-new never-before-seen monsters like the asteroid worm, star fairy, meteor dragon, and supermassive singularity! Don't let your Starfinder Roleplaying Game campaign get lost in space or just be a trek among the stars, grab a copy of this incredible 440-page monster accessory today and Make Your Game Legendary! NOTE: PDF available now. Print and Print/PDF bundles expected to be available in November. That is a *LOT* of space monsters!!! Any chance you can provide a single page, to show what one might expect, as a sample?